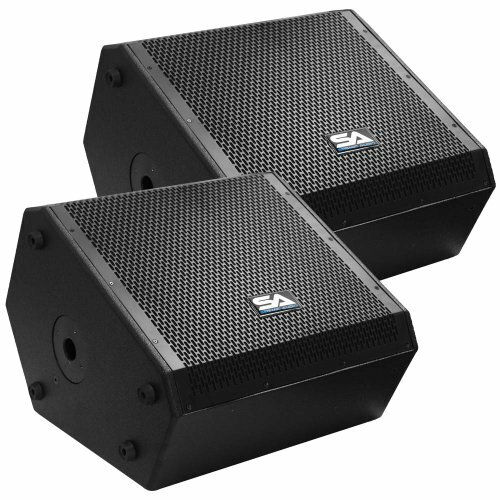 Pair of Compact 15 Inch 2-Way Coaxial Floor / Stage Monitors with Titanium Horns - 300 Watts RMS Each - PA/DJ Stage, Studio, Live Sound 15 Inch Monitors - MODEL: SAX-15M (Pair), CONTENTS: Pair of 15inch 2-Way Coaxial Floor/Stage Monitors, CONDITION: New, APPLICATION: PA Floor Monitors / Live Sound / Stage / Studio, ACTIVE/PASSIVE: Passive, WOOFER: 15inch Coaxial Loudspeakers, WOOFER SPECS: LF: 70 oz Magnet and 3inch Voice Coil - HF: 15 oz Magnet and 1.75inch Voice Coil, POWER: 300 Watts RMS; 600 Watts Peak each, FREQUENCY RESPONSE: 55 Hz - 20k Hz, SENSITIVITY: 97 dB, SPL: 117 dB, CONNECTORS: Dual Speak on, NOMINAL IMPEDANCE: 8 Ohms, PORTS: No, GRILL: Full Metal Grill, HANDLES: Discreet Recessed Pocket, COVERING: Black Painted Texture, ENCLOSURE: 7 Ply Birch Plywood, POLE MOUNT: Yes - Comes with Standard Top Hat and Threaded Pole Mount, DIMENSIONS: 19inch x 19inch x 14.25inch, WEIGHT: 41.5 lbs per Cabinet, WARRANTY: One Year Warranty, SPECIAL FEATURES: Can be Daisy Chained, SPECIAL FEATURES: Bi-Amiable. The Seismic Audio X series of Coaxial Monitors are ideal for any Pro Audio application. Whether you are doing live sound, in the studio, an emcee, a DJ gig, or karaoke...The ability to hear yourself on stage is essential. The X Series of Coaxial monitors give you a true sense of your sound! It is the perfect solution for the musician that is seeking high quality sound as well as a monitor that is easy to use and easy to set up! Its coaxial design means that all the sound flows from the same source, providing you with more uniform coverage! These monitors allow you to produce high output levels while using a significantly smaller footprint!